100% certified natural. Restores mature skin. Strengthens and firms. Increases skin's resilience. Certified natural facial care.Age Revitalising Day Cream Reduces deep wrinkles, makes facial contours appear more defined and strengthens skin. Protect against free radicals. Evening Primrose Facial Care Restores mature skin This powerful range helps restore and firm while promoting radiance. Containing organic evening primrose oil it helps strengthen skin's structure, makes facial contours appear more defined and increases skin's resilience. Evening Primrose: Helps stimulate the natural defence system and restorative processes of mature skin. 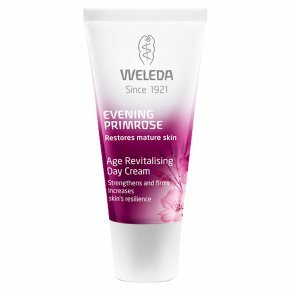 Age Revitalising Day Cream The rich restoring formulation intensively moisturises, plumping and firming the skin. It helps protects against free radicals. Deep lines appear reduced and the skin feels treated and revitalised. The complexion appears even and firm. Application: Apply every morning to your cleansed face, neck and dé-colletage.